Custom 10ft air inflatable tube man also known as sky puppet. entertain and engage your audience the best way possible, Feather Flag Nation has created an advertisement solution for you. We offer you an easy and quick way to increase traffic to your location. You are welcome to browse our selection, and we’re optimistic that you will be satisfied with our products. One of our newest additions is the custom 10 ft air inflatable tube man (requires 12” diameter air blower to use). This form of advertisement can help you to promote brand awareness and make you stand out from the rest of the competition. This inflatable tube man is 12 feet high with the bottom end attached to a high-powered electrical blower. The 12” diameter blower comes with a handle that allows it to be pulled with a strap. As the sleeve inflates, air from the end of the tube is pumped up to the entire length (10 ft) of the sleeve. This causes the tube to “air dance” in every direction. Of course, such an exciting movement is attractive and attention-getting, especially when it is positioned in a visible space. The electrical blower is accompanied with stabilizing pole to provide protection in windy weather. Different manufacturers use different materials in making inflatable tube man. Feather Flag Nation designed the 10 ft air inflatable tube man with the best fabric. After listening to our customer’s feedback and carrying out research, we observed that nylon isn’t the most durable material for a sky puppet. 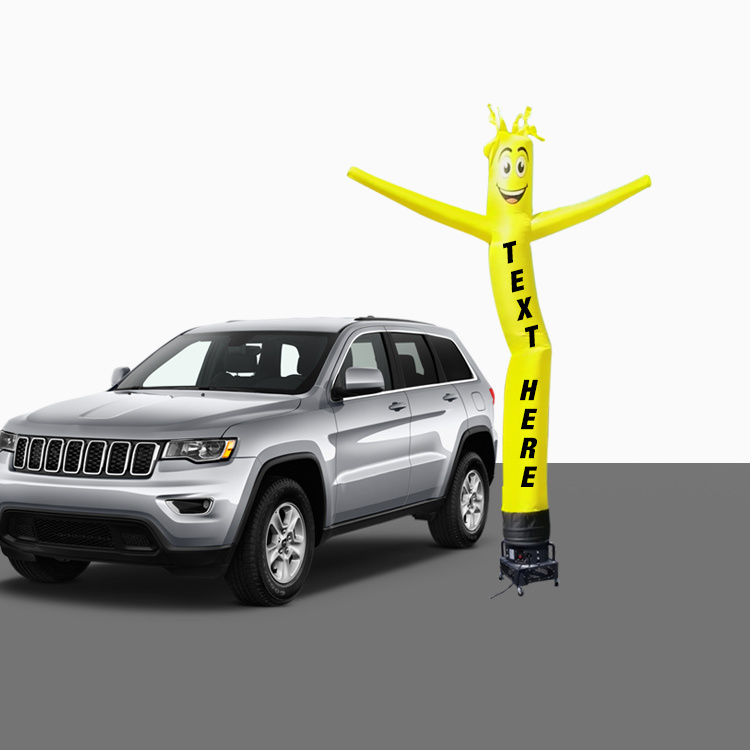 Since nylon-made sky dancers are prone to puncture, we decided to use a sturdier material (a special form of polyester) for the custom 10ft air inflatable tube man. Not only is this material durable but it is long lasting and can withstand stubborn winds. There are no restrictions to the rich color options of this sky dancer. Depending on your choice and the theme of your event, there are different colors of sky dancers to select from. To get the best result and to convey an easy message to your audience, simply select the color that best describes your brand. Sometimes, some magical additions to the surrounding can make an event livelier. Be it picnics, family gatherings, products lunch, wedding ceremonies or any other form of celebration, our custom 10 ft air inflatable tube man is the perfect choice for you. 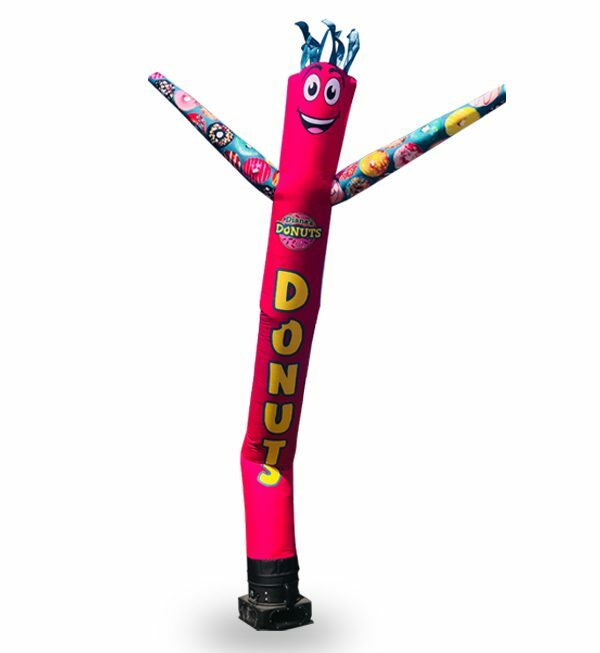 This 10 ft tube man can entertain and leave an unending smile on your guests. describe your design and request free design now. Free design services get a proof in 30 minutes or less during office hours production takes only 3 business days (NOT 2 WEEKS LIKE OTHER COMPANIES). Design and production are done in-house (NOT IN CHINA LIKE OTHER COMPANIES).